Sometimes, the best way to enjoy the catch of the day is by preparing it whole. If you've never cooked a whole fish before, it can be rather intimidating. Trying to choose the right method, complimentary ingredients, and not to mention cleaning out a fresh fish can be rather intimidating. Once delving into it, however, you will find that your inner culinary expertise takes over and it's time to shine. After all that hard work you did to catch your lucky prize, or carefully select it from the market, it deserves only the best recipe. From a basic lemon and olive oil dressing to a mind-blowing authentic Thai recipe, here are the 12 ways you'll want to prepare your roasted fish dishes. So heat up the grill or fire up that oven because this is what fishing is all about. Fire up the grill because this trout stuffed with fresh herbs, cloves of garlic, and slices of lime is simply irresistible. When you're working with a large fish, you have to flavor appropriately. Don't be afraid to be heavy-handed with the kosher salt and the extra-virgin olive oil. Get the recipe here. After carefully cleaning out your trout, keep the seasoning simple and stuff it with this secret ingredient from A Fox in the Kitchen. Then, pair it with a beetroot and lamb's lettuce salad for a refreshing, gourmet meal. When it comes to easy recipes, it doesn't get any easier than this. Umm, do we even need words? If we must, this will easily become one of your favorite recipes. Keep extra lemon slices around for spritzing to cut through the fat of the bacon. You'll want to start cooking whole fish more often after this. Get the recipe here. Sometimes, when cooking a whole fish it's best to let the flavors of the meat shine by using simple ingredients. With salmon, you know you've reached peak cooking perfection when the fish flakes. Get the recipe here. Salting your fish seals in the juices while adding a hint of saltiness. Give it a try with your European Sea Bass and your handy baking sheet. A salt crust definitely belongs in your recipe box. Requiring only a handful of ingredients, it's a nice twist on your usual grilled whole fish recipe. Get the recipe here. How should you prepare your branzino? Grill it for about three minutes per side then drizzle with a tangy rosemary vinaigrette and serve with a cold brew. Those are the local flavors. That's how you should do it. Whether it's a smaller fish or a larger fish, the proportions are always right. Get the recipe here. Mackerel may be a bottom feeder, but this Whole Grilled Mackerel recipes sure isn't. Packed with flavor and only requiring five ingredients, this recipe is a keeper. Cooking fish has never been simpler. Each catch deserves a proper recipe. If you happened to reel in a snapper, get the barbecue going because this Barbecued Whole Snapper with Lemongrass and Lime Leaves recipe is beyond worthy. Made for the grill, make sure you're using a big fish for the full effect. The trick to cooking a whole red snapper lies in the blend of spices and grilling technique. 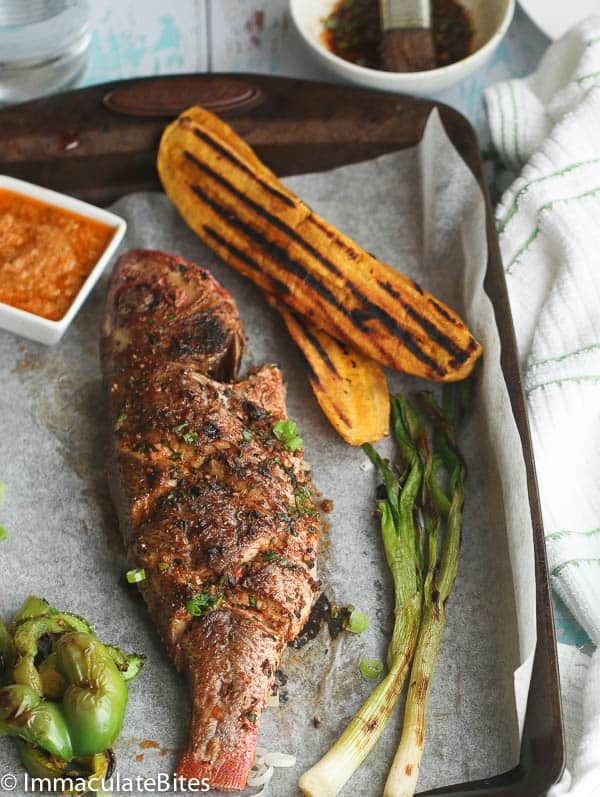 Let Immaculate Bites show you how a pro does it with this Caribbean Grilled Whole Red Snapper. In the mood for something ethnic? Then you have got to try this Authentic Thai Grilled Fish. With this Chinese style Steamed Whole Bass, you're in for a real treat. A blend of ginger, soy, scallions, and cilantro dress the bass for an ethnic dish that is easier to make than you would think. Because sometimes, you're feeling fancy. Get the recipe here. If you need a little help keeping a flaky fish from falling apart on the grill, then try this Stainless Steel BBQ Grilling Basket. The heat resistant wooden handle is comfortable on your hands while the stainless steal basket is durable enough to handle the open flame. With the lockable grill grate feature, you won't have to work about your fish jumping out of the basket. For only $21.99 with your Amazon Prime you can ensure that you get a perfect grilled fish every time.